Sigep, the international exhibition on technologies for coffee, ice cream, pastry and artisanal bakery, has been inspiring as always, also for the professional furniture sector of bar venues and ice cream showcases. How do we achieve efficiency targets that combine increasingly high refrigeration performance and under-control consumption? First of all, with an increasingly precise and careful sizing of the refrigeration units, depending on the desired placement of the refrigerated display cabinet. 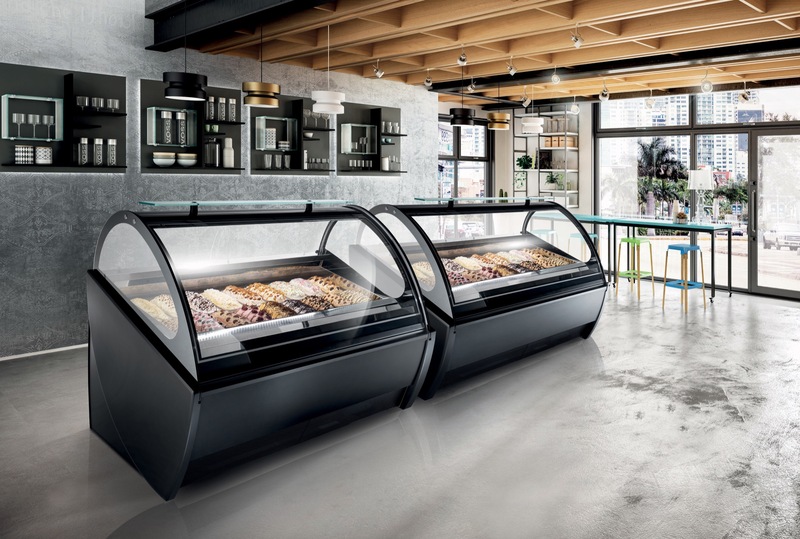 Frigomeccanica has introduced refrigerated showcases that can be used both for ice cream or pastry and bar products, simply by organizing the interior either with a stainless-steel shelf or with the lodgments of ice cream buckets. These showcases, depending on the set-up, change their function while maintaining the same external appearance. Optimizing industrial processes, this type of design allows manufacturers to standardize the production of some of the components, such as the external cases, the lights, the glass elements, which remain the same in all the versions, while what changes is the internal refrigeration units and possibly the electronics and the control software. The advantage for the end user, who is the operator of the business to the public, is to be given solutions that are perfectly integrated for what regards the furnishing, and that allow – at the same time – the diversification of the handling. Moreover, bars are becoming well-rounded businesses, which are able to work from 6 a.m. to midnight, changing their appearance depending on the different moments of consumption: breakfast, lunch, mid-afternoon snacks, ice cream, aperitif, dinner, after-dinner. The solutions with which the main Italian producers, like Frigomeccanica, are getting increasingly outstanding results on the energy-saving front, are just as ingenious. The perspective on which this is based is a more efficient management of the venue and a higher responsibility towards the environment. One of the most resourceful solutions, among those that were presented at the exhibition in Rimini, concerns the introduction of a “hybrid” refrigeration system, that is able to use the two main technologies of “cold production” within the same machine: the compression cycle, which requires electric motors, and the absorption cycle, which allows, instead, for the passive maintenance of a low temperature for a certain period. Frigomeccanica offers glass windows that open automatically to the approach of a person, let it be the bartender about to pick up fruits for his cocktails or milkshakes, or instead a patron who wants to take a bottle of water or a soda. The opening of the glass panels is operated by infrared proximity sensors that are similar to those which, for instance, activate the sliding doors in shops or malls, reducing the thermal dispersion of the windows. These ice-cream showcases have large glass surfaces but at the same time they are not subject to thermal dispersion, especially thanks to the use of special, low-emission, glasses and special insulation methods, infinitely more well-finished today than the models of only a few years ago. For what regards design, the last Sigep has confirmed some recent trends in bar furnishing, vintage style being just one example of this: the recall to the lines of the Seventies, squared but at the same time including a wide use of curved glass, and the combination of surfaces in solid colours with metal inserts. Another widely confirmed trend is that of the “full view” windows, almost completely in glass and low in height, in order to allow a comfortable view of the exposed product from the top. In these solutions the glass becomes also the surface that supports the passage of the products or the consumption, and must therefore be scratch-resistant in order to avoid the rapid creation of an opaque effect from the frequent rubbing of glasses, plates and cups. This is a largely adopted solution among the new pastry-bar systems. As far as the pastry shop window is concerned, the trend of the moment privileges the squared, deep and wide display solutions, that are generally white, even on the inside, and that make use of hygienic materials such as fiberglass, with a large use of glass panels. The display level is lower than one-meter in height, to offer the guest a panoramic view of all the variety of exposed products from the top. Obviously, windows of this type entail special care from the management in the organization of the product exposure, which has to be ordered, rational and readable. The space of the window must therefore be studied in a way that makes it possible to optimise every centimetre, following the rules of visual merchandising. 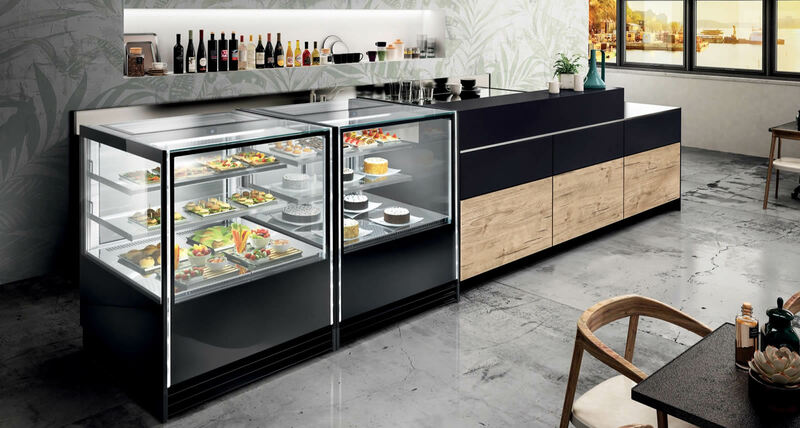 It should be noted that this type of showcase is increasingly being used in bakery-style venues – for the exposition of panini, stuffed croissants, tramezzini and every kind of sandwich – so not only for cakes or pastries. Lastly, there has been some innovative proposals that have been conceived in order to transform certain types of bars into extremely elegant, modern and functional venues, where the very idea of service is deconstructed and does not even call for the counter element anymore, if not for the coffee area. 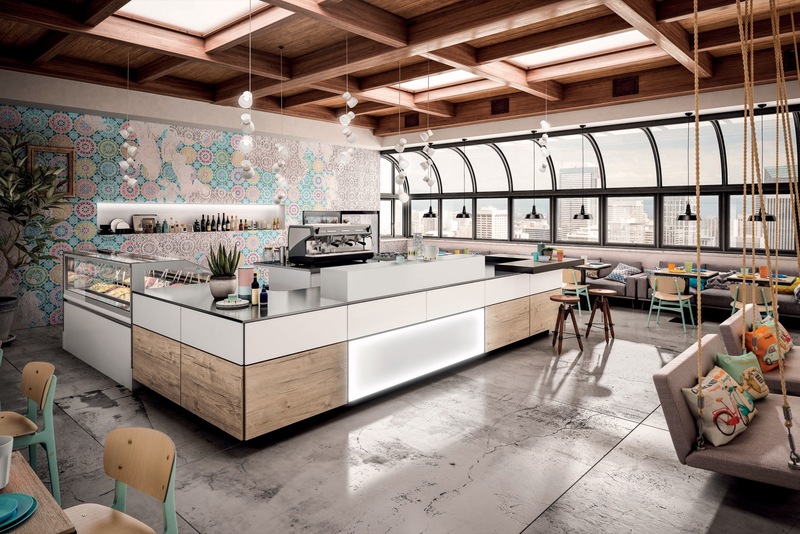 For example, the professional furniture solutions by Frigomeccanica are similar to those of a modular home kitchen, which allows for the creation of islands that contain drawers or refrigerated baskets in which to store bottles or cans. We’ll see if this kind of concept will spread, giving rise to destructured spaces in which the public can move freely. In this case, the experts are talking about island layouts or thematic areas: spaces without architectural barriers where the display equipment is arranged asymmetrically and without a formal or geometrical order, thus creating an absolutely free visit flow. 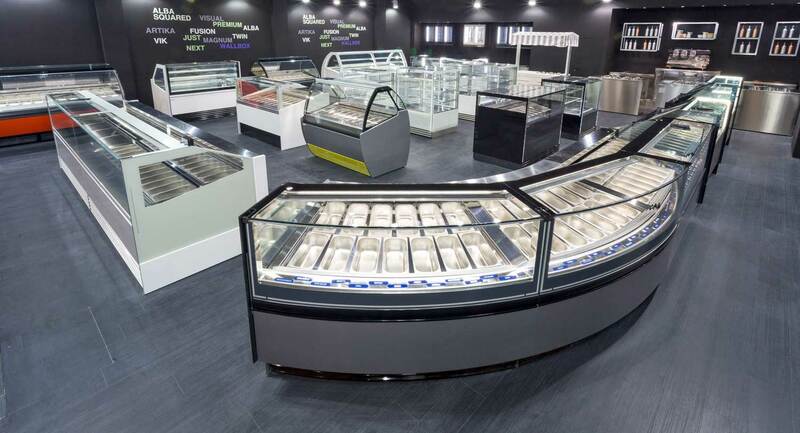 Besides, the growing success of formats that mix free service, specialized corners and catering points is obvious to all, and this is an approach that emphasizes the exposure of the products, exalts the assortments within modular structures like the showcase counters and stimulates a more emotional approach to the consumption activity. It is a trend that suggests a new future for bars too. 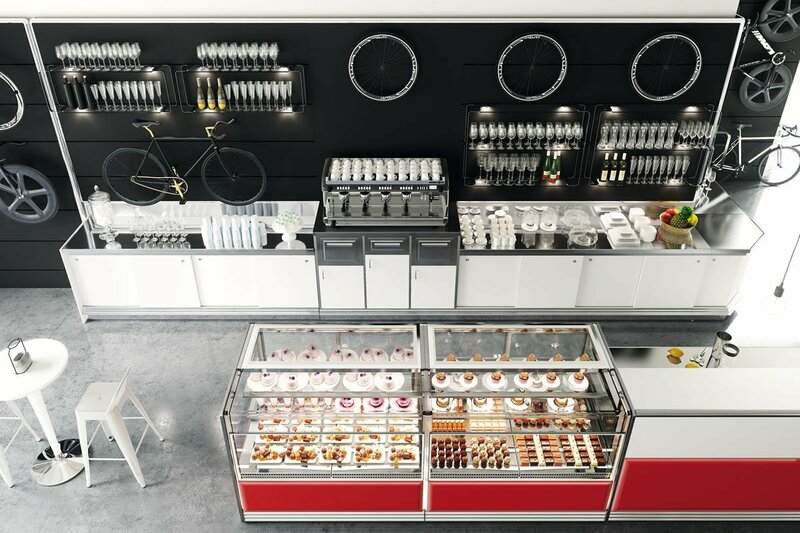 The inspiring philosophy of each line of furnishing and refrigeration products of Frigomeccanica is based on three fundamental components: modularity, technical efficiency and design. The group Frigomeccanica completely Italian reality, is on the market with its brands Frigomeccanica, Stiltek and Officine 900. Its production facilities are located in the center of Italy, in the province of Teramo. Frigomeccanica has got 150 employees on a covered area of over 40,000 square meters. The production, supported by ultra-modern equipment and machines, includes furniture for bar, showcases for ice cream, bakery, grocery, deli and furniture for public exercises in general. In its 40 years of business, the strength of the company has always been the constant technological and aesthetic research. Frigomeccanica with its brands is the leader of HO.RE.CA industry and is synonymous of quality, reliability and competitiveness on the national and international market. Copyright © 2017 Frigomeccanica S.r.l.